Former Trump lawyer John Dowd gave a superbly informative interview, published Wednesday, to the Washington Examiner’s own Byron York. But Dowd was way off-base in the potshots he took at former Attorney General Jeff Sessions. The lawyer completely misrepresented the circumstances surrounding Sessions’ recusal from the Russia-related investigation. In so doing, Dowd exacerbated Sessions’ status as one of the most unreasonably maligned public servants in recent years…. Dowd is wrong on multiple levels and outrageously so on one of them. The outrageous assertion is that Sessions’ recusal from the Russia investigation was a dereliction of duty, all because Sessions feared “blowhards” in the Senate. This is a flat-out smear. Sessions was advised to recuse himself by the Justice Department’s internal ethics office. Any attorney general who ignored such advice would deserve to be hounded from office. The public would have no confidence in such an attorney general or any investigation overseen by him. And that’s why the ethics office exists: to give an unbiased view to an official, in this case Sessions, legitimately uncertain as to whether he had triggered the grounds for recusal. MOBILE, Ala. — In a rare public appearance since his resignation last November, former Attorney General Jeff Sessions Thursday night gave a ringing defense of his tenure as head of the Justice Department. It was and is a defense well worth making. 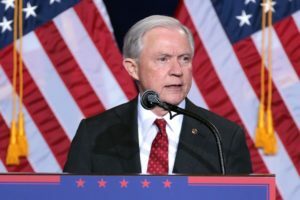 Sessions was speaking in his hometown of Mobile, Ala., at a dinner celebrating the 30th anniversary of the Alabama Policy Institute, one of the first and most successful of the nation’s growing number of conservative state think tanks. API’s co-founder and longtime president, Gary Palmer, is now in Congress, heading the House Republican Policy Committee. About ten or 12 minutes into his 35-minute address, Sessions discussed his two-year stint as AG. Referring only by inference to President Trump’s criticisms of his recusal from the Russia-related investigation that roiled politics for two years, Sessions’ tone was wry and a bit self-deprecating. Interrupted by a standing ovation from his hometown crowd, he finally was able to be heard again with a simple, declaratory statement that presaged the rest of his speech: “We did a lot of good in the Department of Justice.”….